1) Does Spotify work on extenders? No. Spotify don't currently have any windows libraries, so I can't directly get their streams. Instead I open the Spotify PC application in the background to play the audio. This doesn't get picked up by the extender, which only plays audio that comes from within media center itself. Spotify have told me that they are considering windows libraries, which would allow me to give a great user experience on the PC, but at the moment the Spotify apis (for linux) stream Ogg audio, which isn't a supported format on extenders, so unless that changes with the release of windows libraries, it still won't work on extenders. 2) Does last.fm work on extenders? No, the audio fails to play on extenders. I suspect that extenders are doing something odd like requesting the track twice, which last.fm don't allow. 3) How do I get a free spotify account? Just go to this link to register. There is currently an issue with last.fm where some accounts can be validated and some accounts can not. There doesn't seem to be any pattern to the accounts. See here for the latest from last.fm on it. If you are not currently a last.fm premium subscriber and want to play content through Songler, my advice is to sign up with last.fm for a free account, and then enter your username and password in Songler. If you get the confirmation message saying that your login has been validated but you can't yet play music, then your account is fine, and you can go ahead and upgrade to a premium last.fm account. If you get an error that your account cannot be authorized, register a new free account and try again until it works. I'd love feedback on how it goes for you, whether it succeeds or fails, so that I can get a picture of the extent of the problem. E-mail me at martin@milliesoft.co.uk with your feedback. I need to have more information about why. The first way to do that is to turn on logging. To do that open up regedit, and navigate to HKEY_LOCAL_MACHINE\SOFTWARE\Wow6432Node\MillieSoft\Songler for 64 bit systems or HKEY_LOCAL_MACHINE\SOFTWARE\MillieSoft\Songler for 32 bit. Right click and select New->String Value. Create a registry key called logFile with it's value set to a location where it can write a log file, e.g. Then run the Songler program again, and various diagnostic messages will be written to the log file. You should also get the full stack trace of the error. To do that depends on what version of windows you have. In windows vista, open up regedit and go to HKEY_CURRENT_USER\Software\Microsoft\Windows\CurrentVersion\Media Center\Settings\Extensibility add a DWORD key EnableErrorDetails and set the value to “1”. Windows Media Center will then add a Details button to the Error dialog box with a stack trace of what's wrong. Take a screenshot of that. In windows 7, no all you need to do is launch Event Viewer and navigate to the Applications and Services Logs > Media Center node to find the full errors. To install TunerFree MCE, make sure you uninstall any previous versions first (this will not remove your preferences), and then run the installer file. As part of installation, you will be given the option of having support for US and/or UK programs. This allows you to change the initial settings, but you can always change that later in the preferences screen even if you choose not to install one of the components at this time. During the intallation process, TunerFreeMCE will build a list of all of the programs currently available. This process takes about 5 minutes, and is then repeated every 12 hours in the background to make sure your program list is up to date. TunerFree MCE is accessed in Vista Media Center either on the TV bar, or in Program Library under Online Media. 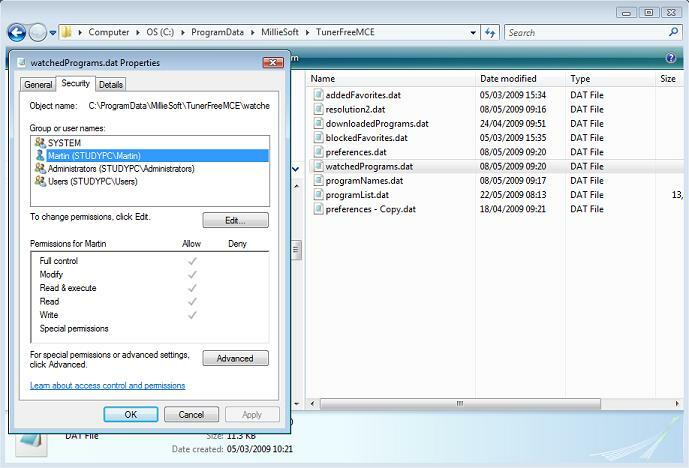 In Windows 7, it is under the Extras Library. When you first open it, it will show a list of channels. When you pick a channel, it will display all available programs from that channel. Instead of channels, you can also choose to to pick programs by date, with BBC programs going back 7 days, Channel 4 2 weeks, ITV and Five up to a month, and Hulu about 50 years by the looks of some of the old episodes on there!. You can also search for programs by name, which searches across all of the channels. When you click on a BBC program, you will be taken to a page where the BBC flash player is playing the program in a small window. It will quickly jump to full screen. If it does not, navigate to the full screen button at the top left and press it. When either in full screen or on the mini-player page, pressing Pause will pause playback, and pressing Play will resume it again. Pressing |< will jump back to the start of the program. Pressing >| will toggle between High and Normal resolution (unless you default to always be in high definition). Pressing Stop in Full Screen will exit full screen and stop playback. This is preferred to pressing the clear or Escape key because the system can then keep track of what state it is in. If when opening a BBC program you get a guidance warning, you can press the 1 key to dismiss it and start playback. If you want to stop the guidance warning, open internet explorer, then go to Internet Settings -> Privacy, and add bbc.co.uk to the list of allowed sites. 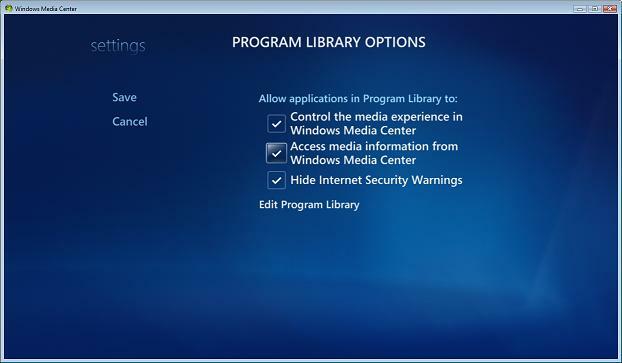 Then in media center, navigate to a program that requires guidance and confirm that you are over 16 and enter password. The system will then no longer prompt for guidance. When you click on an ITV program, you will be taken straight to the video. Because of the way they stream programs, you can use the remote to fast forward, rewind, play and pause. When you click back, you will be taken to a screen where the video is playing in a smaller window, and then you need to click back again to go back to the program list. When you click on a Channel 4 (including E4 and More 4) program, you will be taken to a page where the Channel 4 flash player is playing the program in a small window. It will quickly jump to full screen. If it does not, navigate to the full screen button at the top left and press it. When either in full screen or on the mini-player page, pressing Pause will pause playback, and pressing Play will resume it again. Pressing Stop in Full Screen will exit full screen and stop playback. If when opening a Channel 4 program you get a guidance warning, you can press the 1 key to dismiss it and start playback. When you click on a Five program, you will get different behaviour depending on which program you pick. Older Five programs behave the same as ITV – they play directly like normal video. With newer programs, FIve have changed to use Flash content, so you will get taken in to the Five website with the program playing, and it will go full screen within 10 seconds. When you click on a Hulu program, you will be taken to the Hulu web page with that program playing. It can take a while for the program to start playing, so when it has, press the Full Screen button to jump to full screen. When either in full screen or on the mini-player page, pressing Pause will pause playback, and pressing Play will resume it again. Pressing >| will toggle between High and Normal resolution. Pressing Stop in Full Screen will exit full screen and stop playback. This is preferred to pressing the Clear or Escape key because the system can then keep track of what state it is in. You can search for programs by name in the Search screen. Use your remote to enter the text like you would on a mobile phone, and the list of programs that match will be shown to the right. There is a particular way of using search that may not be obvious. After searching, you probably want to press the right arrow to go to the list of matches. Unfortunatly media center doesn't allow be to build that, and you need to press OK to navigate from the search text box to the list of results. As you watch programs, TunerFreeMCE will remember what you watch and automatically add it to a Favourites list. You can also manually add programs to favourites by pressing * on the remote, or block items from ever appearing in the favourites by pressing #. You can turn off favourites in the preferences if you prefer. You can set TunerFreeMCE to automatically update your twitter status with the programs that you are watching so that your followers can see what you have been watching. If you turn on twitter integration, you will also have the option of seeing what programs other twitter users are watching too. You turn on twitter integration by going to Preferences, and clicking on “Set Twitter Username”. This will open a browser window where you can authorize TunerFreeMCE to post to your twitter feed. After authorizing, press “Click after authorization in browser” in the TunerFreeMCE preferences to record the link to twitter. This special browser authorization means that TunerFreeMCE doesn't have to store your twitter username or password, making the system more secure. The preferences screen allows you to turn on and off content from the different channels, as well as changing the cache interval. It also allows you to configure commands for automatic VPN switching so that you can watch programs from both US and UK without having to make any manual changes on your PC. See here for details. It also allows you to change the Click Speed. If you find that TunerFreeMCE sometimes clicks on the play button of the flash player before it has loaded, you may want to change that to Slower (50% increaded delay) or Slowest (100% increased delay). This will give the screen more opportunity to load before clicking. In the preferences screen, you can choose to default to High Resolution feeds from Hulu and BBC. With BBC streams, it will default to the web page for BBC High Definition feeds, and for Hulu it will attempt to press the High Definition button before going full screen.